Our free VM Console enables you to bounce your virtual machines without ever logging into VMware® vCenter™ or vSphere™! Plus, you can track up/down status, take snapshots, and restart VMs even if you’re not a VMware administrator. And the handy desktop dashboard ensures your new VM superpowers are always within reach! Hello, Josh Stevens here, Head Geek at SolarWinds. 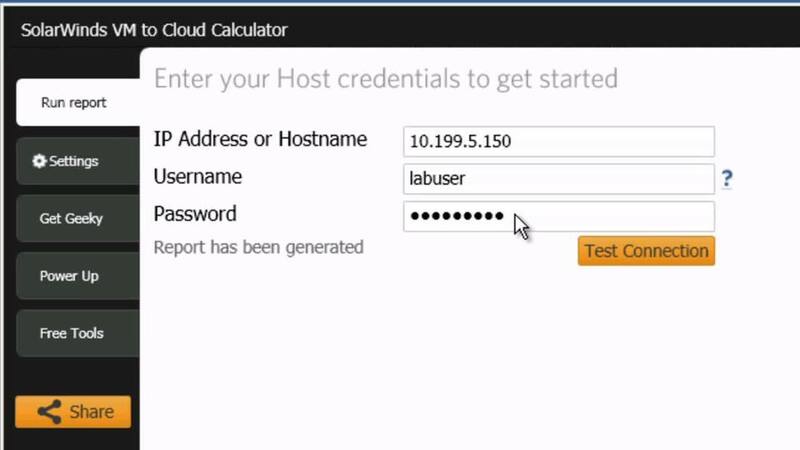 Today we are going to talk about a brand new free tool called SolarWinds VM Console. 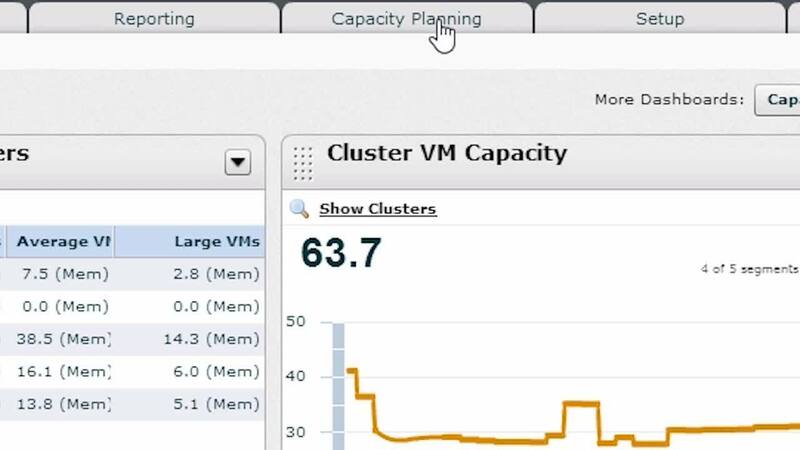 Now, the VM or virtual machine monitor console allows you to keep an eye on them on your virtual machine servers, or your vSphere servers for VMware. And while you are keeping an eye on your desktop, if you need to restart those machines or bounce them, or actually take a snapshot out of the machines, or just keep an eye on how they are doing and then create, do some real time sort of maintenance. It makes it really, really easy to do that from a single console, without having to stop what you are doing, and then log into vCenter and make the changes there. Now, the VM Console is a free application, you can download it from SolarWinds.com, and you know, probably the easiest way to talk about how it works is that I actually show you, so let’s do that now.After you’ve installed SolarWinds VM Console, you’ll be prompted to enter in the IP address or server name, username and password for either one of your vSphere ESX servers or even a vCenter server. Now, the username and password you’ll enter are the username and password that you’ve used to logged in to VMware, so these are VMware set of credentials, not the Windows user credentials. I’ve entered in here one of the IP addresses for one of our vCenter servers here on the left. 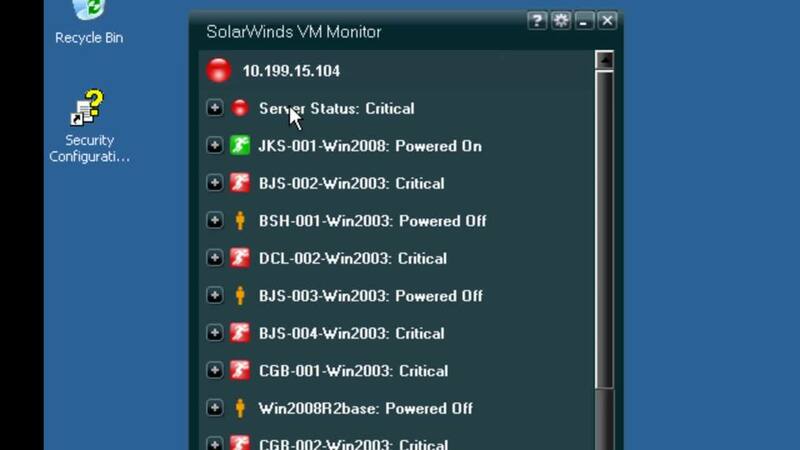 Then simply click OK.Once you’ve done that, the SolarWinds VM Console begin pulling information about all the different ESX or vSphere servers managed by vCenter, and of course the VM is running on that server. And as you can tell, the VM Console gives you a quick added glance status through this nice little dashboard, showing you the status of each of these VMs, and of course the virtual servers as well. Now, anytime you can go ahead and launch one of these, and simply right-click on it, and choose either Take a snapshot, Shut down the guest, Suspend it, or Restart or bounce the guest. And, you know, as an administrator for VMware, one of the most common things I do as a troubleshooting step, when someone is having a trouble with their virtual server, it just bounce the OS or restart it, and you can do that here. If I choose that I want to restart this one, the first thing it will ask me is: do I want to take a snapshot first, or just simply go ahead and do the balance without it? And I'm not going to do that now because that server is in production, and I'm not exactly sure who is using it. Now, the SolarWinds VM Console also gives you a quick snapshot in to some of those free tools that are available, you can go download those free tools anytime, gives you access to try out the Orion network performance monitor, and to specifically understand how it monitors the virtual infrastructure today, and of course, the Get Geeky tab shows you access to our online community at thwack.com, where we have a lot of content to help you understand more about using our products, and of course managing your infrastructures in general. In a nutshell, the SolarWinds VM Console makes it really easy again, to keep an eye on all of your vSphere servers, by adding in the vCenter server and then tracking those ESX servers on their own. And also let you see the status of the VMs, and of course you can go in and either take a snapshot, start the guest OS or if it’s running, even reboot it and suspend it. A really handy tool to keep to keep around, if you are a VMware administrator out there, or you use virtualization in your environment, and you are constantly having to stop/start/suspend/restart on the first bounces VMs. Again, it’s been Josh Stevens here, Head Geek at SolarWinds. 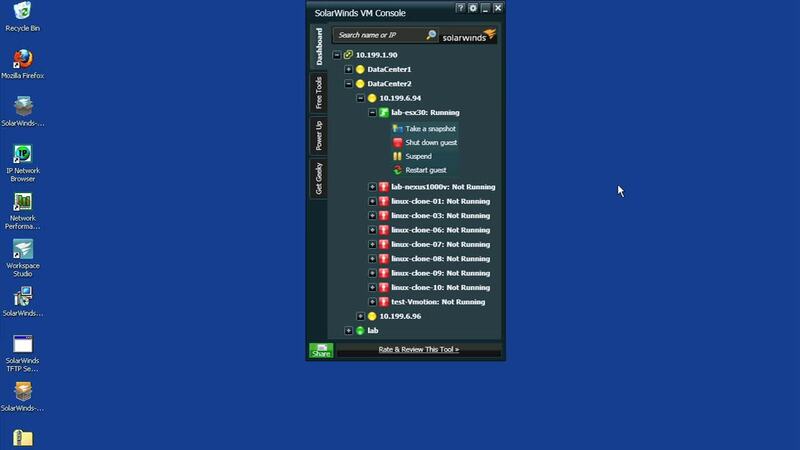 You can download the SolarWinds VM Console for free at SolarWinds.com, and check it out for yourself. Thanks.